Why Use A Rapid Tyre Deflator? One of the most important things when it comes to off roading is tyre pressures. A rapid tyre deflator can help you achieve the exact desired tyre pressure in a matter of seconds. Overinflated (or road/highway tire pressures) will be the first thing to stop a 4WD from moving in sand. On rocks and harsh terrain overinflated tires will suffer punctures, tears, tread block damage and will give the vehicle and its passengers a very unpleasant ride. There are many ways to lower the tires, a stick, screw on deflators, risking unscrewing the valve core and by using a rapid tyre deflator. How The Rapid Tyre Deflator Works. The rapid tyre deflator works by screwing onto the valve where the valve cap was. Once fully screwed on a center pin is pushed in, turn it anti clockwise while pushing it in to unscrew the "Valve core". Once unscrewed simply push the outer brass fitting on the rapid tyre deflator down, this will release the pressure by 1 psi per second. Pull the brass fitting on the rapid tyre deflator back up to check the tyre pressure and push back down to release more air until the desired psi is reached. Once the desired psi is reach with the rapid tyre deflator pull the brass fitting back up and start to screw the valve core back in by using the center pin to push it back in while screwing clockwise this time. Once secure pull the center pin back up and unscrew the rapid tyre deflator and repeat on the other 3 wheels. It will take you longer to read these instructions than to use the rapid tyre deflator once used it a few times. We have done testing on these rapid tire deflators for a good while now (3 years). We found them to be more accurate on psi readings than the big name brands. 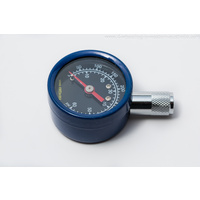 We can safely say that our rapid tire deflators are within 0.5-2 psi accurate from our testing. We are pleased to be able to offer our tire deflators at a very competitive price compared to the 4x4 market and we hope this encourages many keen 4 wheel drivers to get a rapid tyre deflator for themselves. This could go a long way to prevent track damage, vehicle damage and overall increase the off road experience. Getting the exact tire psi desired. A safe way to unscrew the valve core without risking losing it in the dirt while deflating. Rapidly deflating the tyres giving you more time to off road. Allowing a better experience off road. In soft sand there is no hope of continuing without lowering the Tyres as they will simply just dig a hole stopping any forward or reverse movement. Tires with lowered psi will assist the vehicle in crawling over logs, rocks, harsh terrain and unsuspected stumps sticking out of the ground. Encountering any of these situations with hard tires (45-30 psi) will more than likely end up in damage. Lowering the tires on sand and dirt tracks will prevent track damage caused by spinning wheels, this will also go a long way in preventing track closures. Watch This Video To See How The Rapid Tyre Deflator Works.